[The] soft-glowing facade always seems more real to Ivory than harsh reality...represent[s] our own attempts to stave off reality with the romantic projections of cinema. 135 min. Sony Pictures Classics. Director: James Ivory. 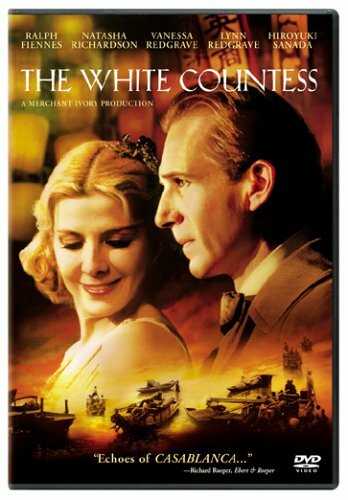 Cast: Vanessa Redgrave, Natasha Richardson, Ralph Fiennes, Lynn Redgrave, John Wood. A painted lady becomes the muse of a visionary blind man, while a third man dreams of repainting Japan on "a broader canvas." It's all painted with light in the customary manner of James Ivory and his producing partner Ismail Merchant. The White Countess marks the final Merchant-Ivory film to see release (Merchant passed away earlier this year), and its fervid pursuits—artistic, political, and romantic—make fitting final touches. From a screenplay by Remains of the Day author Kazuo Ishiguro, Ivory works up a tasteful romance with echoes of Casablanca. Ralph Fiennes plays Todd Jackson, a blind former diplomat from America once called "the last hope for the League of Nations" and now living in 1936 Shanghai. A connoisseur of the city's dive bars, Jackson decides finally to create the nightclub of his dreams. He finds his ideal hostess in a prostitute who was once a countess in her native Russia; Natasha Richardson plays Sofia, the sad-eyed refugee beauty. As a romance, The White Countess is pretty standard stuff, as is the hokey plotline involving the countess' selfish, ironically God-fearing family (played by Vanessa and Lynn Redgrave, Richardson's mother and aunt). But the theme of elusive ideals is intriguing: Jackson's shadowy friend Matsuda (Hiroyuki Sanada) has his own idea of how to make his native Japan "a great nation," one that will require the brutal sacrifice of the Chinese status quo. As for Jackson, he tenaciously protects his vision, through perfectionism and denial (he refuses a verifying touch of Sofia's face). His obsessions and barely suppressed traumas suggest he may be a touch mad, a state Ishiguro compares and contrasts to an innocent young dreamer, Sofia's daughter (Ivory even allows her reveries about boats to spring, briefly, into animation). For their part, Sofia and her family respectively dream of love and lost glory reclaimed. The greatest truth of The White Countess is that characters, the history, the beautiful trappings all—as in Casablanca—represent our own attempts to stave off reality with the romantic projections of cinema. Jackson alludes to requisite qualities for nightclub entertainment—"the threat of violence...sexuality"—and for his hostess ("the allure, the tragedy, the weariness...my centerpiece"). Furthermore, he complains, "There's no political tension in here," but his wish becomes the filmmakers' command in another smooth "set against the backdrop of..." movie romance. The acting is excellent, with Fiennes delivering another nimble, risk-taking turn and Richardson radiating the requisite emotional need. Both characters guard unspoken hurts, which will inevitably (as in Remains of the Day) spill out in moments of unbearably beautiful tragedy. If these moments are less than wholly convincing, it's because The White Countess' soft-glowing facade always seems more real to Ivory than harsh reality. Sumptuously, seductively, The White Countess resolves in the comfort of human endurance, at least for its white protagonists. Sony's classy special edition pays tribute to late producer Ismail Merchant with a rich transfer, crisp audio, and a host of bonus features. On a screen-specific commentary track, director James Ivory and star Natasha Richardson amiably recall their memories of the production and respective intentions, as well as commenting on the talent—not surprisingly, Fiennes brought a method ethic to the set—the finer points of underarm hair and peeling potatoes, and how Merchant was responsible for Fiennes' casting. "The White Countess: On Location in Shanghai" (11:12) features B-roll footage, clips, and comments by Ivory, Fiennes, Richardson, Vanessa and Lynn Redgrave, Allan Corduner, Hiroyuki Sanada, and DP Christopher Doyle. "The Making of The White Countess" (13:26) adds comments by production designer Andrew Sanders, costume designed John Bright, choreographer Karole Armitage, and special effects coordinator David Fletcher. The fascinating stitch-job "A Tribute To Ismail Merchant" (12:59) includes excerpts from various sources, including a 60 Minutes profile of Merchant-Ivory by Steve Croft, and comments from Merchant and Ivory (often, uproariously, together), Ruth Prawer Jhabvala, Sir Anthony Hopkins, Emma Thompson, Simon Callow, Hugh Grant, Uma Thurman, Jeffrey Katenberg, Utpal Dutt, and Zakir Hussain. Trailers for Memoirs Of A Geisha, Why We Fight, The Passenger, Look At Me, Ladies In Lavender, The Best Of WWII Movies, and The Premiere Frank Capra DVD Collection round out the disc, a fitting capstone to any Merchant-Ivory collection. All site content © 2000-2019 Peter Canavese. Page generated at 04/24/2019 07:19:43AM.